Sometimes I need to get an idea of signal levels coming from an ALSA capture device, like a line-in on a sound card, and I only have a ssh session available. For example, I've recently been exploring a case of radio-frequency interference causing audible noise in an audio circuit of an embedded device. 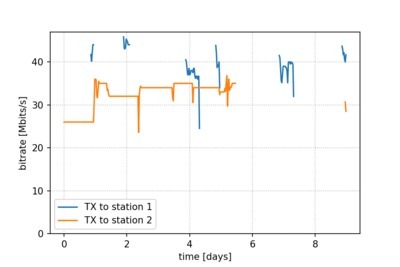 It's straightforward to load up raw samples into a Jupyter notebook or Audacity and run some quick analysis (or simply listen to the recording on headphones). But what I've really been missing is just a simple command-line tool that would show me some RMS numbers. This way I wouldn't need to transfer potentially large wav files around quite so often. This captures 5 seconds of audio (trim 0 5) from the default ALSA device (-t alsa -d), runs it through the stats filter and discards the samples without saving them to a file (-n). The stats filter calculates some useful statistics and dumps them to standard error. A different capture device can be selected through the AUDIODEV environment variable. The displayed values are pretty self-explanatory: min and max levels show extremes in the observed samples, scaled to ±1 (so they are independent of the number of bits in ADC samples). Root-mean-square (RMS) statistics are scaled so that 0 dB is the full-scale of the ADC. In addition to overall mean RMS level you also get peak and trough values measured over a short sliding window (length of this window is configurable, and is shown on the last line of the output). 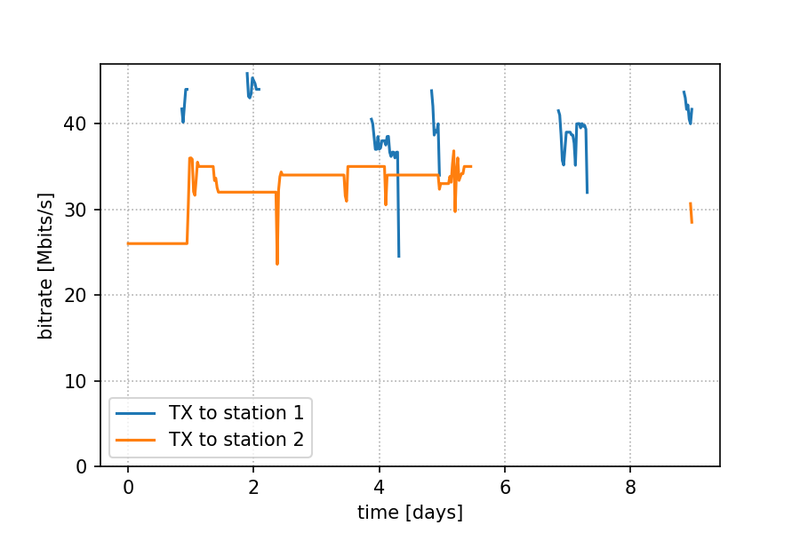 This gives you some idea of the dynamics in the signal as well as the overall volume. Description of other fields can be found in the sox(1) man page. I don't like replacing old technology that isn't broken, although I wonder sometimes whether that's just rationalizing the fear of change. I'm still using a bunch of old Schlumberger Cryptoflex (e-Gate) USB tokens for securely storing client-side SSL certificates. All of them are held together by black electrical tape at this point, since the plastic became brittle with age. However they still serve their purpose reasonably well, even if software support for them has been obsoleted a long time ago. So what follows is another installment of the series on keeping these hardware tokens working on the latest Debian Stable release. Some trial and error and git bisect led me to commit 8eb9ea1 which apparently caused this issue. It was committed between releases 1.8.13 (which was shipped in Jessie) and 1.8.14. This commit introduces some subtle changes in the way buffers of data are exchanged between pcscd and its drivers, which break openct 0.6.20. There are two ways around that: you can keep using pcscd and libpcsclite1 from Jessie (the 1.8.13 source package from Jessie builds fine on Stretch), or you can patch openct. I've decided on the second option. The openct driver is no longer developed upstream and has been removed from Debian in Jessie (last official release was in 2010, although there has been some effort to modernize it). I keep my own git repository and Debian packages based on the last package shipped in Wheezy. My patched version 0.6.20 includes changes required for systemd support, and now also the patch required to support modern pcscd version on Stretch. The latter has been helpfully pointed out to me by Ludovic Rousseau on the pcsc-lite mailing list. Other smart card-related packages work for me as-shipped in Stretch (e.g. opensc and opensc-pkcs11 0.16.0-3). No changes were necessary in Firefox configuration for it to be able to pull client-side certificates from the hardware tokens. It is still required however, to insert the token only when no instances of Firefox are running. Here are some overdue news regarding modern development tools for the vintage Z80 architecture. I've been wanting to give this a bit of exposure, but alas other things in life interfered. I'm happy that there is still this much interest in old computers and software archaeology, even if I wasn't able to dedicate much of my time to it in the last months. Back in 2008, Stefano Bodrato added support for Galaksija to Z88DK, a software development toolkit for Z80-based computers. Z88DK consists of a C compiler and a standard C library (with functions like printf and scanf) that interfaces with Galaksija's built-in terminal emulation routines. His work was based on my annotated ROM disassembly and development tools. The Z88DK distribution also includes a few cross-platform examples that can be compiled for Galaksija, provided they fit into the limited amount of RAM. When compiling for Galaksija, the C compiler produces a WAV audio file that can be directly loaded over an audio connection, emulating an audio cassette recording. This November, Stefano improved support for the Galaksija compile target. The target now more fully supports the graphics functions from Z88DK library, including things like putsprite for Galaksija's 2x3 pseudographics. He also added a joystick emulation to Z88DK cross-platform joystick library. The library emulates two joysticks via the keyboard. The first one uses arrow keys on Galaksija's keyboard. The second one uses the 5-6-7-8 key combination in the top row that should be familiar to the users of ZX Spectrum. He also added a clock function that uses the accurate clock ticks provided by the ROM's video interrupt. This made it possible to build more games and demos for Galaksija. 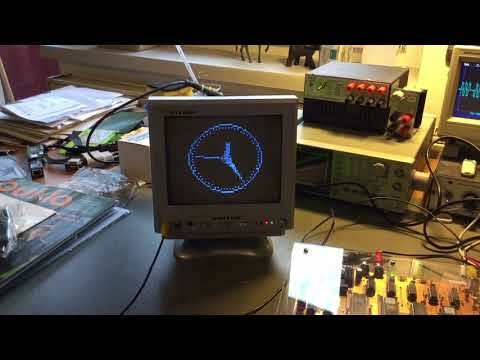 I've tried the two-player snakes game and the TV clock demo and (after some tweaking) they both worked on my Galaksija replica. To try them yourself, follow the Z88DK installation instructions and then compile the demos under examples/graphics by adapting the zcc command-lines at the top of the source files. The second piece of Z80-related news I wanted to share relates to the z80dasm 1.1.5 release I made back in August. z80dasm is a disassembler for the Z80 machine code. The latest release significantly improves handling of undocumented instructions that was reported to me by Ast Moore. I've already written in more detail about that in a previous blog post. Back in November I've also updated Debian packaging for z80dasm. So the new release is now also available as a Debian source or binary package that should cleanly build and install on Jessie, Stretch and Sid. Unfortunately the updated package has not yet been uploaded to the Debian archive. I have been unable to reach any of my previous sponsors (in the Debian project, a package upload must be sponsored by a Debian developer). If you're a Debian developer with an interest in vintage computing and would like to sponsor this upload, please contact me. Update: z80dasm 1.1.5-1 package is now in Debian Unstable. Piping Curl to Bash is dangerous. Hopefully, this is well known at this point and many projects no longer advertise this installation method. Several popular posts by security researchers demonstrated all kinds of covert ways such instructions could be subverted by an attacker who managed to gain access to the server hosting the install script. Passing HTTP responses uninspected to other sensitive system commands is no safer, however. 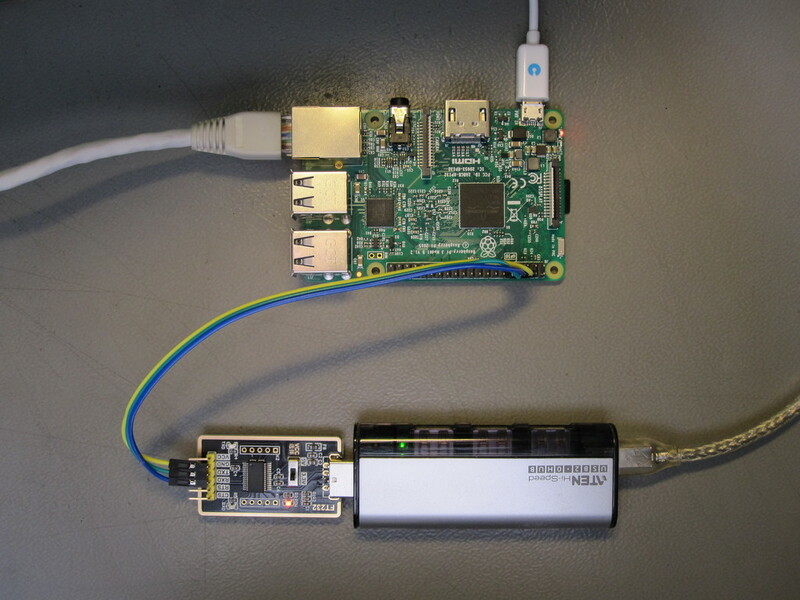 The APT keyring is used to authenticate packages that are installed by Debian's package manager. If an attacker can put their public key into this keyring they can for example provide compromised package updates to your system. Obviously you want to be extra sure no keys from questionable origins get added. Docker documentation correctly prompts you to verify that the added key matches the correct fingerprint (in contrast to some other projects). However, the suggested method is flawed since the fingerprint is only checked after an arbitrary number of keys has already been imported. Even more, the command shown specifically checks only the fingerprint of the Docker signing key, not of the key (or keys) that were imported. The key file used in the example above was created by simply concatenating the two ASCII-armored public key blocks. It looks pretty suspicious in a text editor because it contains two ASCII headers (which is probably why pgpdump stops processing it before the end). However, two public key blocks could easily have also been exported into a single ASCII-armor block. This is becoming a summer of retro computing blog posts, isn't it? In any case, today I'm pleased to announce the release of z80dasm 1.1.5, the latest version of my disassembler for the Z80 CPU machine code. Ast Moore recently noticed that z80dasm doesn't recognize several well known undocumented instructions. When I made z80dasm on the base of Jan Panteltje's dz80 several years ago my goal was to make a disassembler that would correctly produce an assembly listing for Galaksija's ROM. While I did add support for the sli instruction back then, it seems that Galaksija didn't use any of the other undocumented instructions. z80dasm 1.1.4 did correctly include unknown instructions in the disassembly as raw hex values with defb directives, however it guessed the length of some of them wrong, which desynced the instruction decoder and produced garbage output. The output would still assemble back into the same binary, but the point of a disassembler is to produce human-readable output, so that was not very useful. Fixing this problem was a bit more involved than I expected, but not for the usual reasons. One of the guidelines I had with z80dasm was to keep z80dasm and z80asm a matched pair. Being able to reproduce back the original binary from disassembled source is very useful when hacking on old software as well as in testing z80dasm. Unfortunately, it turned out that z80asm is quite bad at supporting these undocumented instructions as well. For instance, inc and dec with ixl and ixh register operands are not recognized at all. Some other instructions, like add with these undocumented operands produce wrong opcodes. I guess this is not surprising. In contrast to the official instruction set there is no authoritative documentation for these instructions, so even the names differ in different sources. For example, both sli a and sll a mnemonics are commonly used for the cb 37 opcode. I tried to fix some of the problems with z80asm I found, but it turned out to be quite time consuming. Both z80asm and z80dasm are written in, by today's standards, quite an archaic C style, with lots of pointer arithmetic and packing various unrelated things into a single int variable to save space. While I'm still fairly familiar with z80dasm code, the modifications I did to z80asm took a several sheets of paper to figure out. In the end, I gave up and solved the problem of z80asm compatibility by leaving z80dasm to decode undocumented instructions as defb directives. However, the instruction lengths should now be decoded correctly and also the mnemonic is included in a comment for better readability. There is now also a new --undoc option in 1.1.5. If it's specified on the command-line, z80dasm will place all instructions directly into the disassembly. As before, you can get the source code for z80dasm in a release tarball or from the git repository. See the README file for install instructions and the included man page for explanations of all command-line options. z80dasm is also included in Debian, however 1.1.5 has not been uploaded yet. Recently I replaced an old 2.4 GHz-only Linksys WRT54GL wireless router with a shiny new, dual band TP-Link Archer C20 (hardware version V1). Unfortunately, the new router brought some unusual problems. It turns out some devices are now unable to get a global IPv6 address when connected over Wi-Fi. For example, my Android 5.1 smartphone and my work laptop with Debian Jessie and Network Manager don't get IPv6 connectivity. They worked just fine when connected through the old router. At the same time, a different phone with Android 6.0 seems to have no problems with the new Archer C20 router. First a brief note on the network setup: Archer C20 is used here as a wireless access point only. Some other host on the network acts as a gateway to the Internet. 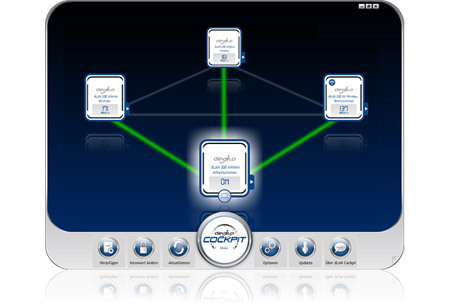 That host also provides a DHCP service for IPv4 and runs the route advertisement daemon (radvd) for IPv6 SLAAC. The setup has been quite well tested and works flawlessly on the wired Ethernet. The old WRT54GL has also been used in this way, which is why IPv6 connectivity on the Wi-Fi worked fine even though the old router's firmware had no explicit IPv6 support. 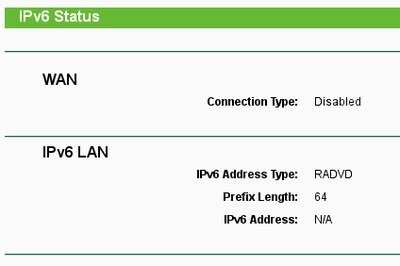 The IPv6 problem is somewhat frustrating to diagnose, since it only appears some time after the router has been restarted. For instance, I've usually seen that IPv6 stops working the next day after a reboot. Similarly, changing some unrelated settings, like the wireless SSID, also appears to temporarily fix the issue, only for it to reappear after a while. Searching the web I can find some discussions about similar problems with TP-Link routers, with no clear conclusion. The firmware changelog does say in a vague way that the latest version fixes an IPv6 problem. However, I've tried the V1_160427 and V1_151120 firmwares and they both behave in the same (broken) way. IPv6: wlan0: IPv6 duplicate address fe80::a288:xxxx:xxxx:xxxx detected! This appears to be the progress of a normal attempt at a IPv6 autoconfiguration from the laptop's side. The laptop (with the MAC address a0:88:...) sends some packets to a IPv6 multicast address (33:33:...). However, all these packets seem to be immediately reflected back to the laptop by Archer C20. 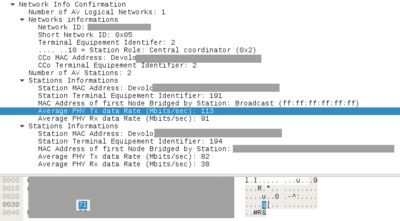 The incoming packets highlighted in yellow are byte-by-byte identical to the preceding outgoing packets, with only the destination address in the Ethernet header changed from the multicast to the laptop's MAC address. These incoming packets are not present when the laptop is connected to one of the wired LAN ports, or when using the old wireless router. These reflected packets trigger the duplicate address detection in the laptop's network stack and the autoconfiguration is interrupted. It seems that at some point in the Archer C20 uptime, IPv6 multicast groups stop working correctly. In fact I don't understand why it even tries to do anything special with those. WRT54GL had no concept of IPv6 and it worked fine. 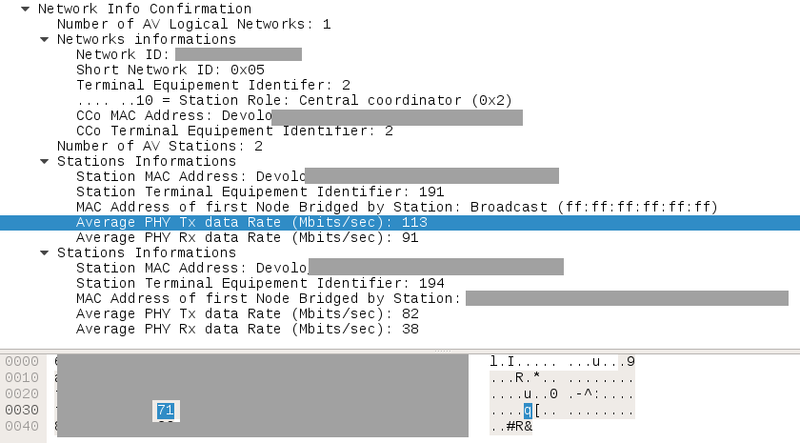 I've experimented with other options that looked related to multicast (like IGMP settings), but with no success. So unfortunately at the moment I don't have a good network-side solution. Any suggestions would be most welcome. Changing the stock firmware might work, but support in OpenWRT for this hardware currently seems experimental at best. The device-side work-around is to disable DAD like I show above, but this is somewhat ugly. There might be a way to disable it on a per-network basis with Network Manager (see dad-timeout), but I have not tried this yet. It is also still not clear why some devices appear to work. It might be that Android simply disabled duplicate address detection in 6.0. Update: This Mikrotik manual suggests that such repeated multicast packets are expected on wireless access points that are aware of multicast addresses. So it still might be that the problem is somewhere on the client side. I did find out that enabling Client Isolation on the Archer C20 fixes this problem (with the obvious side effect that wireless clients can no longer talk to each other). dad-timeout NetworkManager option is not supported on Debian Jessie. Update: Client Isolation doesn't actually help. After a few days I'm again getting the dadfailed flag. Some time ago I was playing with animation making applications on a (non-pro) iPad. I found the whole ecosystem very closed and I had to jump through some hoops to get my drawings back onto a Linux computer. However the fact that you can draw directly on the screen does make some things easier compared to a standalone Wacom tablet, even if the accuracy is significantly worse. One other thing in particular stood out compared to my old GIMP setup. These applications make it very easy to jump frame by frame through the animation. In one touch you can display the next frame and do some quick edits and then move back with another touch. You can browse up and down the stack as a quick way to preview the animation. 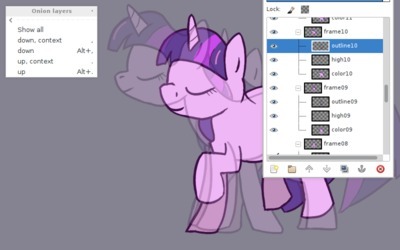 They also do something they call onion layering which simply means that they overlay the next and previous frames with reduced opacity so that it's easier to see how things are moving around. This is all obviously useful. I was doing similar things in GIMP, except that changing frames there took some more effort. GIMP as such doesn't have a concept of frames. Instead you use image layers (or layer groups) as frames. You have to click to select a layer and then a few more clicks to adjust the visibility and opacity for neighboring layers if you want to have the onion layer effect. This quickly amounts to a lot of clicking around if you work on more than a handful of frames. 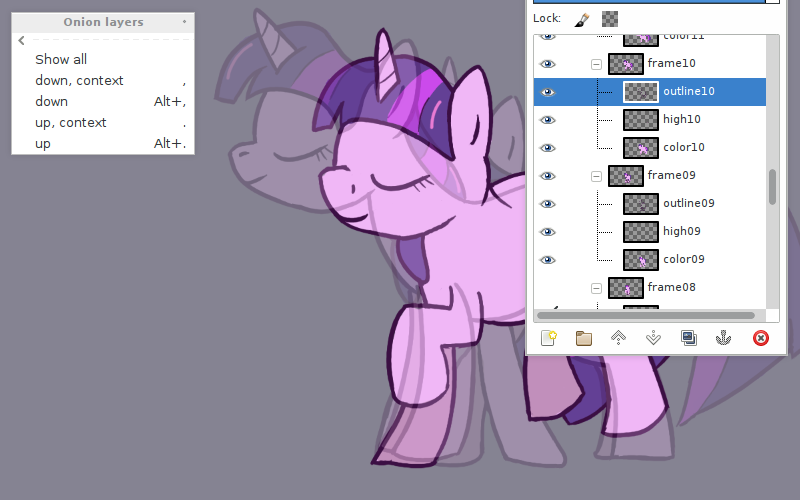 GIMP does offer a Python plug-in interface however, so automating quick frame jumps is relatively simple. Relatively, because GIMP Python Documentation turns out to be somewhat rudimentary if you're not already familiar with GIMP internals. I found it best to learn from the Python-Fu samples and explore the interface using the built-in interactive console. The end result of this exercise was the GIMP onion layers plug-in, which you can now find on GitHub together with installation and usage instructions. 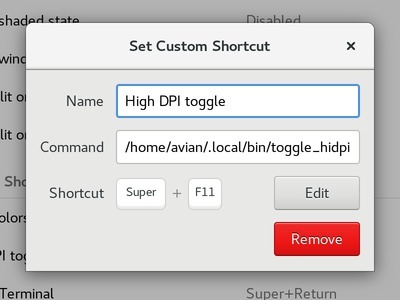 The plug-in doesn't have much in terms of an user interface - it merely registers a handful of python-fu-onion- actions for stepping to previous or next frame, with or without the onion layer effect. 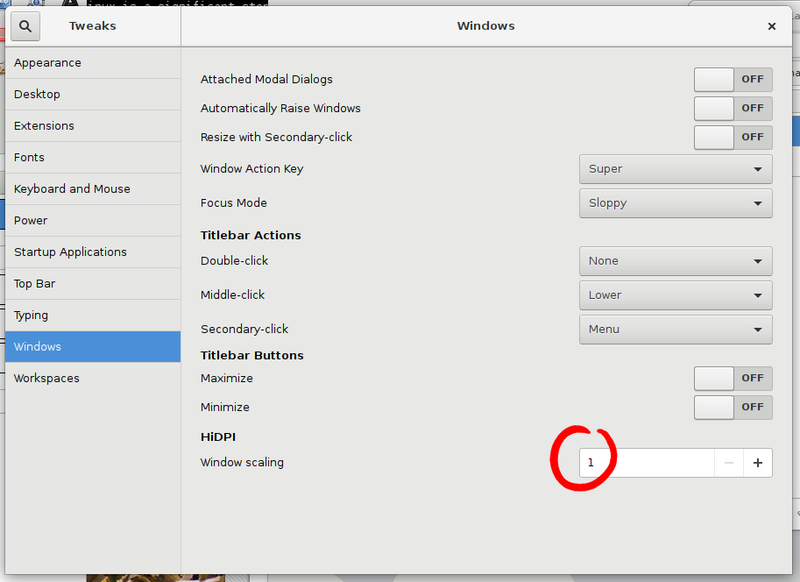 The idea is that you then assign keyboard (or tablet button) shortcuts to these actions. You will have to define the shortcuts yourself though, since the plug-in can't define them for you. I like to use dot and comma keys since they don't conflict with other GIMP shortcuts and match the typical frame step buttons on video players. If you follow the layer structure suggested by the Export layers plug-in, this all works quite nicely, including handling of background layers. The only real problem I encountered was the fact that the layer visibility and opacity operations clutter the undo history. Unfortunately, that seems to be the limitation of the plug-in API. Other plug-ins work around this by doing operations on a duplicate of the image, but obviously I can't do that here. I should note that I was using GIMP 2.8.14 from Debian Jessie, so the code might be somewhat outdated compared to latest GIMP 2.8.20. Feedback in that regard is welcome, as always. Poking around youtube-dl I found this interesting recipe on how to package a self-contained Python application. Youtube-dl ships as a single executable file you can run immediately, or put somewhere into your PATH. 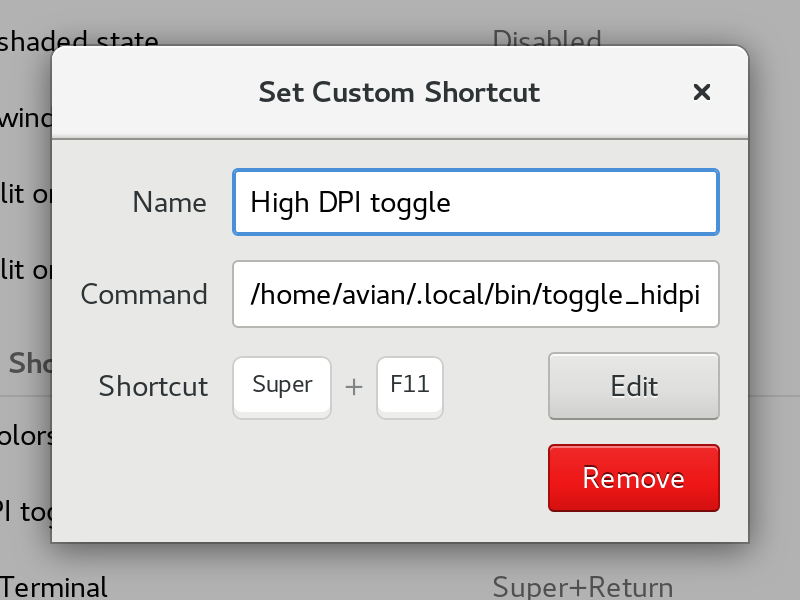 This makes it very convenient to use even when you don't want to do the usual pip install dance. Of course, it comes at the cost of not resolving any dependencies for you. How does this work? Apparently it's quite an old trick with some added refinement. Already since version 2.3 Python knows how to import modules directly from ZIP files in the same way as from the usual directories. Python also allows executing modules from the command-line. It sounds very much like Java JARs, doesn't it? The only missing part is the #!... line that makes the Linux kernel use the Python interpreter when executing the file. Since ZIP format ignores any junk that precedes the compressed data, the line can simply be prepended as if the whole file was a simple Bash script. Dovecot IMAP server can use a standard Maildir for storage of messages inside user's home directories. The default in that case is to store search indexes and control files in the same directory structure, alongside mail files. That can be convenient, since no special setup is needed and everything is stored in the same place. However, this doesn't work very well if you have disk quotas enabled on the filesystem that stores Maildirs. In case a user reaches their quota, Dovecot will not be able to write to its own files, which can lead to problems. Hence, documentation recommends that you configure a separate location for Dovecot's files in that case. This is done with INDEX and CONTROL options to the mail_location specification. You can just set this up and leave old index and control files in place. In that case, Dovecot will automatically regenerate them. However, this is not ideal. It can take significant time to regenerate indexes if you have a lot of mail. You also lose some IMAP-related metadata, like message flags and unique IDs, which will confuse IMAP clients. It would be better to move existing files to the new location, however the documentation doesn't say how to do that. I found that the following script works with Dovecot 2.2.13 on Debian Jessie. As always, be careful when dealing with other people's mail and double check that the script does what you want. I had my share of problems when coming up with this. Make backups. # Run as "migrate_dovecot.sh user path-to-users-maildir" for each user. # connected (and can't connect) while this script runs! # Correct after double-checking that this script does what you want. # ~/Maildir/.Foo/dovecot.index should go to index/.Foo/dovecot.index. # similar way to indexes. There is the same exception for .INBOX. # subscriptions file should go to the root of the control directory. # the control directory. This seems to be fine. See special items section in the Redirect router documentation. By default, Exim in Debian will attempt to deliver mail for all user accounts, even non-human system users. System users (like list above) typically don't have a traditional home directory set in /etc/passwd. This means that mail for them will get stuck in queue as Exim tries and fails to write to their mailbox. Because spam also gets sent to such addresses, mail queue will grow and various things will start to complain. Traditionally, mail for system accounts is redirected to root in /etc/aliases, but some accounts just receive a ton of spam and it's better to simply reject mail sent to them. Another thing worth pointing out is the Handling incoming mail for local accounts with low UID section in README.Debian.gz in case you want to reject mail sent to all system accounts. This took way too much time to figure out. There's a ton of guides on how to blacklist individual users for outgoing mail, but none I could find for cases like this. I was half-way into writing a custom router before I stumbled upon this feature. Script for setting up multiple terminals. Sometimes I'm working on software that requires running a lot of different inter-dependent processes (are microservices still a thing?). Using systemd or some other init system for starting up such systems is fine for production. While debugging something on my laptop however it's useful to have each process running in its own X terminal. This allows me to inspect any debug output and to occasionally restart something. I used to have scripts that would run commands in individual GNU screen sessions, but that had a number of annoying problems. echo "File contains one command per line to be started in a terminal window." gnome-terminal -e "/bin/bash --rcfile \"$RCFILE\""
The terminal doesn't immediately close after the command exits. Instead it drops back to bash. This allows you to inspect any output that got printed right before the process died. The command is printed on top of the terminal before the command runs. This allows you to identify the terminal running a particular process in case that is not obvious from the command output. For some reason, gnome-terminal's --title doesn't work. The command is appended on top of bash' history list. This allows you to easily restart the process that died (or you killed with Ctrl-C) by simply pressing the up cursor and enter keys.